If you're like me you love fall, and everything about it. The colors, the smell (yes fall as it's own smell, trust me! ), the foods, the weather... And even though I live in a warm climate and our trees don't change colors, and leaves don't fall, and the weather doesn't drop as drastically as I might like, I can still make fall foods! This is the second time I've made Apple Butter in my crock pot, the last time was when I was pregnant with my now 2 year old and it was purely out of an intense craving then. This time my 2 year old was asking for Mommy to make Apple Butter and I came across this recipe. I urge you to try this soon, it has an amazing flavor and your house will smell like fall withing 20 minutes of this cooking! I honestly could see making this and only having it cook a couple hours til it's all soft and serving as a side on Thanksgiving Day! Peel and chop the apples, and toss in the crock-pot in a cap full of lemon juice. Add in remaining ingredients and stir. Cook on low for about 12 hours. It will be a nice dark color. 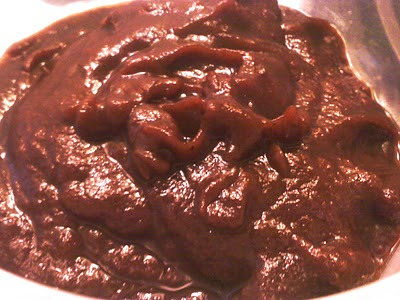 Once cooked transfer it to a blender and puree until smooth. Then can or store in an airtight container. We love this butter! I like it better than just plain Apple Butter, has a better flavor by far. I made a Cranberry Oat Bread to go with it, and it's just a wonderful fall treat! This makes a great gift for the holidays as well. I very highly recommend you make this soon. 5 Stars. This Cran Apple Butter speaks of Fall, and my two all time favorite flavors. I haven't seen cranberries in the stores yet? Where did you get yours? Becky, I buy them in bulk every year when they come out and freeze them to use all throughout the year. I haven't seen any in stores quite yet either, but it will probably only be a matter of weeks!